Carol Kusek and Sandi McMillan recently completed the Boone County State Fair Quilt Block. Carol was the block designer and piecer. Sandi McMillan then quilted the block using threads to enhance the map of the county by sewing in highways and main roads, creeks, rivers and railroad tracks, as well as a section of sandhills. 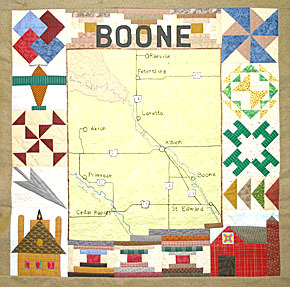 The block theme central design is a map of Boone County with five-inch square blocks representing many of the county’s features. Surrounding the map are blocks that illustrate the county’s special features. Details in the March 16 Albion News/Petersburg Press Print and Electronic Editions by subscription.